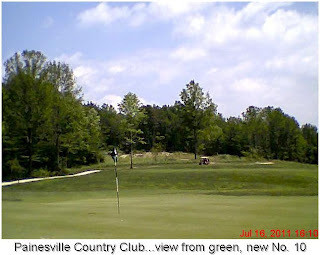 Greens fees: $15.75 (nine holes, walking) to $40.75 (18 holes, cart); senior rates and specials available. DSG is a simple man with simple wishes. Sometime before I pass from this earthly orb, I want to knock a tee shot onto the green at the par-3, 203-yard 3rd hole at Painesville Country Club. Sticking to that timetable, I'm also bound and determined to solve the riddle of the par-4, 402-yard 13th hole. These are two of many difficult holes at the venerable layout in Painesville Township, overseen for three generations by the Alden family. Since I'm partial to family businesses and to Painesville CC, I'll keep going back to Painesville Country Club until I get it right on both of the aforementioned holes in the same round. As I'm now 59 years old, I figure I've got some time. There are many holes at Painesville CC that challenge my modest skills and equilibrium. Comfort is taken in the knowledge I have plenty of company in that regard. Painesville CC begins and ends with long, tough holes - the par-5 521-yard 1st hole and the par-5, 499-yard 18th hole. In between, there are challenging par-4s and par-3s, some diabolical holes (see above, Nos. 3 and 13) and some funky holes, the par-4, 251-yard, hard-left-turn 16th being the funkiest. The new 10th hole - par-4, 317 yards - is a decided upgrade on the old 10th. I played it for the first time last week, made a par and am anxious for a return engagement. My final aside about Painesville CC is a rave for the snack bar's hot dogs and to the old-fashioned split buns into which they nestle. Does the hot dog make the bun or does the bun make the hot dog at Painesville CC? I'll split the difference, pun intended, and pronounce it this union the perfect marriage of both.